Tom Guthrie wants to selectively remove the usernames, passwords, and other bits of text from his browser's AutoFill--or AutoComplete--feature. This one is very simple. When Firefox fills in a field that you'd rather be left unfilled--or filled with something else--click the field. A pull-down menu will appear with one or more options. Point the mouse to the one you want to remove, so that the option is highlighted. But don't click it. Instead, press the DELETE key to remove the option. But Chrome offers more. 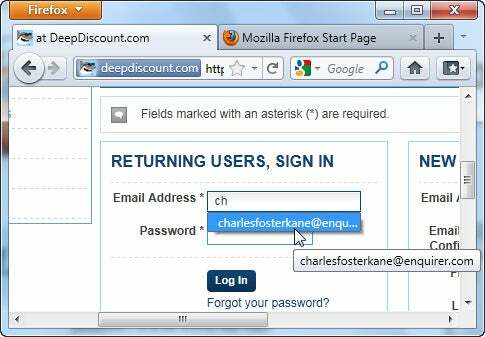 If you enter your name and address into one site's web form, it will remember all the fields together and offer to use them on other sites. It does this not only with addresses but also with credit cards--although I strongly suggest you refuse when Chrome offers to save credit card information.